Does chronic lower back or leg pain prevent you from doing the things you love? Have other treatment options – physical therapy, medication, or invasive surgery – failed to provide long-term relief? Spinal Cord Stimulation (SCS) is a minimally invasive surgery that offers an option for patients whose back or neck pain isn’t fully managed from other treatments. The FDA approved Spinal Cord Stimulation for treating pain from nerve damage in 1989. Now SCS accounts for 90% of all neuromodulation treatments. Spinal cord stimulation directs mild electrical pulses that modify or block nerve activity in a non-medicinal way to minimize the sensation of pain reaching the brain. A small implanted device near the spine generates these pulses. This stimulation has similarities to a cardiac pacemaker, leading some to call the device a pacemaker for pain. Each person is different, and each person’s pain is equally different. The SCS controller offers adjustable control options, with more options being added with each new generation of technology. This level of control is a welcome change for patients dealing with chronic pain. The pain relief from spinal cord stimulation can continue for years, without a need for new pills or frequent office visits. There is typically just one incision needed—to implant the generator—and ever-smaller generators do not require long incisions. The placement of the leads with electrodes is typically done with a hollow needle, rather than through an incision. It has few side effects and is easily reversible; if it doesn’t work or is no longer needed it can be removed. Instead of taking a medication that affects the whole body and causes sleepiness, constipation, or other problems unrelated to the pain, spinal cord stimulation delivers pain relief only where it is needed. Is Spinal Cord Stimulation an Option for Me? At the conclusion of this trial period, if the therapy has proven to give effective relief, your doctor can proceed with a more permanent stimulator implant. 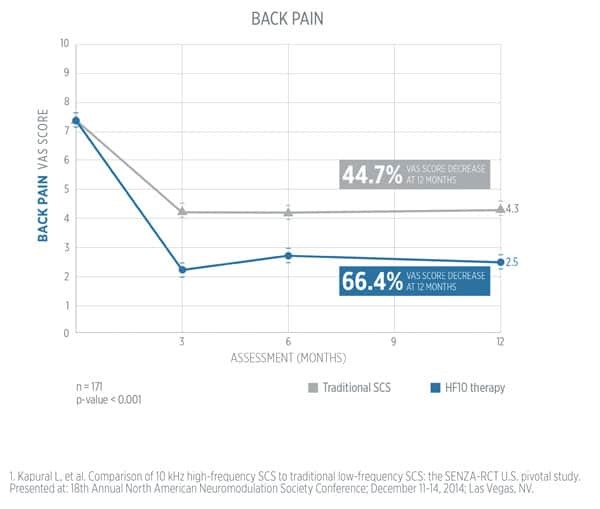 HF10 therapy uses a unique stimulation that effectively manages chronic pain without paresthesia. Unlike traditional spinal cord stimulation systems, HF10 therapy won’t give you an unexpected shock when you bend, twist, or engage in other daily activities. Is HF10 Spinal Cord Stimulation Therapy Right for Me? Spinal Cord Stimulation therapy has helped many SpineOne patients live happy, active lives free from the limitations of chronic pain. If you would like to learn more about this treatment or schedule a consultation, see one of our specialists today. The trial period is typically between 5 to 7 days (usually no more than 14 days), depending on your response to the therapy and your doctor’s recommendation. Unlike other spinal cord stimulation systems, HF10 therapy does not create a tingling sensation, known as paresthesia. 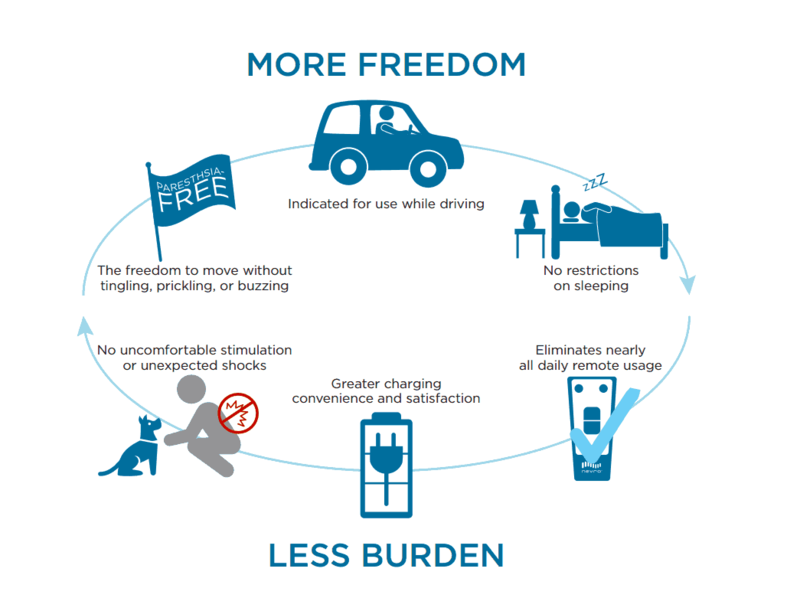 Unlike other spinal cord stimulators, HF10 therapy does not have driving restrictions. However, after surgery, your doctor may advise you to refrain from driving until you have recovered. Can I turn the device OFF if I need to? You can turn OFF HF10 therapy by pressing the red button on the trial stimulator or the remote control. Turn it ON again by pressing + on the remote control. Unlike other spinal cord stimulators, you can keep your system turned ON while you sleep. You can place the trial stimulator to the front or side of your body depending on your sleeping position. Can I go about my normal business? After taking sufficient time to recover, you can return to your usual routine.